Hi friends! Coming atcha a day late with this week's Celebration Series post, but I promise you it's worth the wait. We're talking to Thomas Poarch (aka "Hobby", which is how I'll refer to him from here on out because it just feels weird to call him anything else). We met Hobby through his younger brother, Hunter, who just so happens to be one of our closest friends. And as it turns out, Hobby and Hunter's entire family is amazing and I'll probably beg all of them to be a part of this blog someday. But let's get back to Hobby. This guy is joy, personified. I think the best way that I could describe him is by telling you that the last time he visited us in Portland, he and I drove in circles around my neighborhood, singing "The Candy Man" at the top of our lungs. He's hilarious, captivating, an incredible listener, SO sincere and has a heart of gold. He's one of those people that lives and loves fully without the fear of being judged or misunderstood. Hobby lives in NYC and is an actor and Delta employee, meaning that he's constantly traveling the world. Every time I'm around him I just want to sit at his feet and listen to his stories. And I'm thinking after reading this interview, you're going to want to do the same. Let's get into it! Give us a quick background on who you are and what you do for work. I'm an actor/writer/airline employee. My full-time job is auditioning. I moonlight on the weekends at the airport as a gate agent. What about your work brings you the most joy and fulfillment? As an actor, it's all about the Benjamins - and getting paid to play dress-up and make-believe. For the airlines, I actually love helping people in customer service, and helping them have a good experience. It's probably no surprise that half the time I'm helping to allay people's fears and frustrations. Plus, I'm obsessed with airplanes, airports, flying, and travel. Here's Hobby (on the right) with his incredible siblings Robyn, Hunter, and Hailey. Who or what is inspiring you right now? People fighting for the rights of others. As many parts of the world spin into myopia & fear, there are always those who reach out to help. In disasters, times of fear, trouble, and war, I look for the helpers. That's where hope lies. "Why you going to the airport, flying somewhere?" What has been difficult lately? 2016. Ugh, right? I won't enumerate the problems we face because everybody has Facebook and can read. The difficulty for me is finding the right balance of where I place my attention. I keep thinking about the film, Life is Beautiful. Finding the everyday beauty and joy is the goal and challenge for me. If you follow Hobby on instagram you'll get a serious case of wanderlust. What makes you different from everyone else in the world and how does that uniqueness manifest itself in your work and life? Oh good lord. This question embarrasses me somewhat. OK, let's see… If I have to say, I'm a fair mixture of gravitas and levity, tragedy and comedy. I'm the thespian masks, for heaven's sake. If you're still reading... I suppose I look for and follow the fun. But with an overactive conscience, I fantasize I'm fighting for the underdog against injustice. God, I'm a monster. I love this family so much. Hobby is the one with the ornament in his mouth. Naturally. What's the most embarrassing thing in your google search history? I actually have a verified spirit animal that came to me in a Native American drum circle. I'm serious. It's the turtle. And that makes perfect sense to me. What's your Meyers-Briggs personality type? I prefer savory over sweet. The RNC. Thanks. I'll be here all week. Tell us about an embarrassing childhood memory. More travel. More jealousy from me. What's the longest amount of time you've gone without showering? Five days in Africa when I had malaria. But I smelled okay - like patchouli. Burrowing up in my room stalking Facebook & watching British programs, and Johnny Carson shows. Which Monopoly game piece was your go-to? Do you have any weird quirks? I don't like restaurants, big events, loud places, being out in the sun, people sneezing, or people grooming themselves in public. Yuk. But YUK! If you owned a food truck, what would you serve and why? Vegan corn dogs, butterscotch anything, and cheese - cause I love that stuff. And only 3 beverage choices - sparkling water, wine, and Italian espresso. Hobby, I cannot thank you enough for sharing your joy with me (and the rest of the world). You are a light. You can find more of Hobby on Instagram, Facebook, and pretty much all over the world. 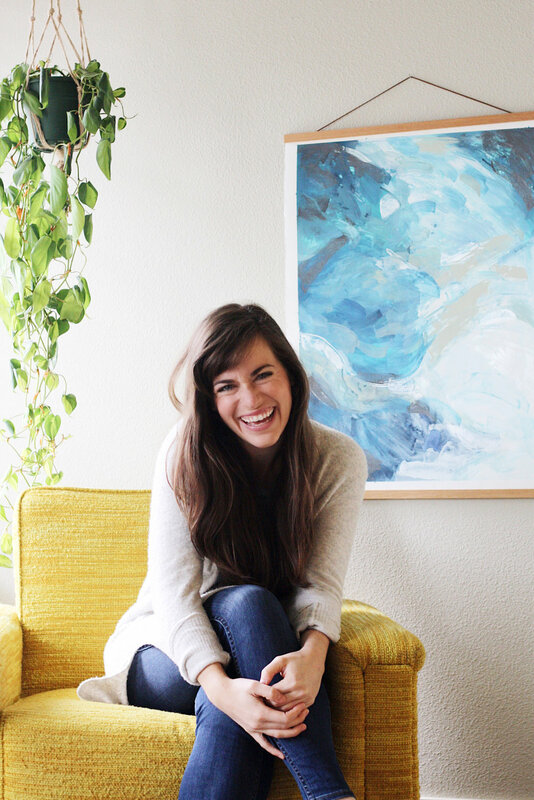 I’m Lindsay — artist, illustrator, graphic designer, and lover of the outdoors. I’m also a wife to Beau, mama to Miles, and dog mama to Walter. Come here for updates about my artwork, musings about life and motherhood, and likely whatever else is on my heart at the moment. I’m so glad you’re here!